In ethics, Elementary 5 continued to explore the different viewpoints across the political landscape, this time by promoting different political parties focused on left wing and right wing viewpoints. 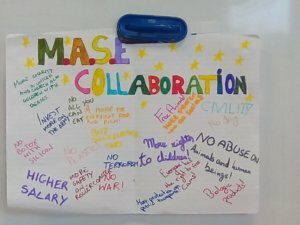 The election took place in Elementary 3 and was a landslide for the ‘MASE COLLABORATION’ who somehow managed to blend both sides under one banner. Little Genius International & Studio La Piramide Scuola Sacro Cuore di Maratea a Little Genius International!